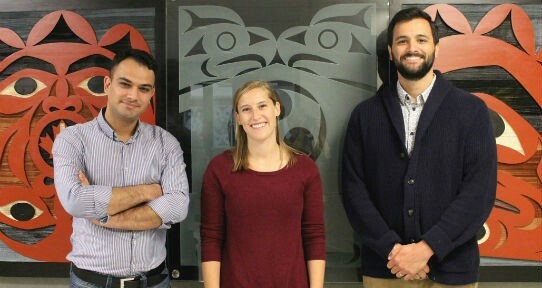 TACs (from l. Amir Andaliby Joghataie, Erin Mirau and Mario Baldassari) standing in front of a cedar and glass work called "Surviving Truth" by Maynard Johnny, Jr., Kwakwaka'wakw and Coast Salish Artist. To help you prepare for your teaching responsibilities, we offer a range of instruction and professional development opportunities. TA Conferences take place every September and January and are designed to help develop and improve teaching skills. The conferences are free for all graduate students. TA Workshops are offered throughout the year for TAs and graduate students who are learning to teach at the post-secondary level. Topics covered include learning how to teach, supporting our students, grading, how to manage technology in the classroom and much more. The Teaching Assistant Consultant (TAC) program positions experienced TA mentors in departments to support TA’s with discipline specific teaching support. Certificate Programs (non-credit) focused on learning and teaching are offered for grad students, TAs, and International Teaching Assistants. Learning and Teaching in Higher Education (LATHE) (credit) is a PhD Graduate Certificate that focuses on the knowledge and practical skills required to teach effectively in higher education.